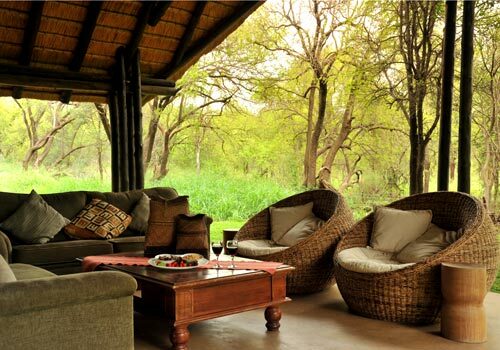 Black Rhino Game Lodge is a hidden treasure set amongst the trees of an old Tamboti forest at the foot of an ancient volcanic crater that today comprises one of South Africa’s most exciting Big 5 eco-tourism destinations, the greater Pilanesberg National Park. 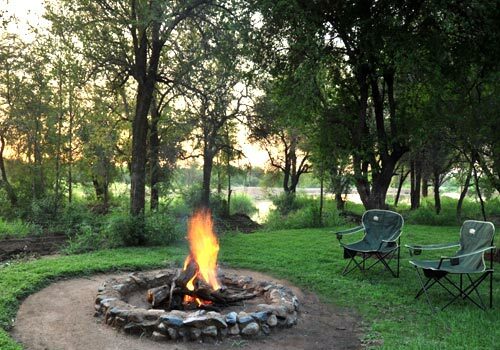 It is from here, accompanied by your personal game ranger, that you will be able explore a 58 000ha malaria free wildlife wonderland and discover the magic of the African bush. The above rates are quoted per person per night. 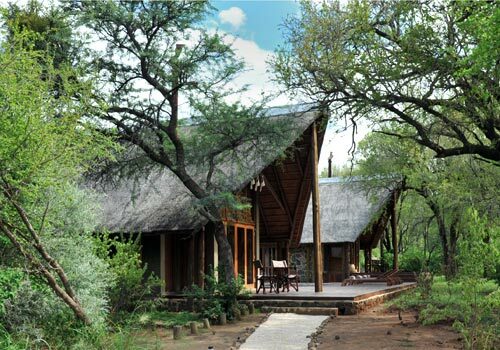 Transfers, beverages and conservation fees, (currently R 121.00 per person per night and R 71.00 per child (4-11 years) per night), which are payable directly at the lodge on departure. Subject to increase in 2019 without prior notification. Children under 12 years of age can be accommodated with parents in the same room. The lodge has a limited number of extra beds so it is subject to availability. 12 years and older Considered as adults and accommodated in their own rooms. Pay full adult rates. together as per the above. 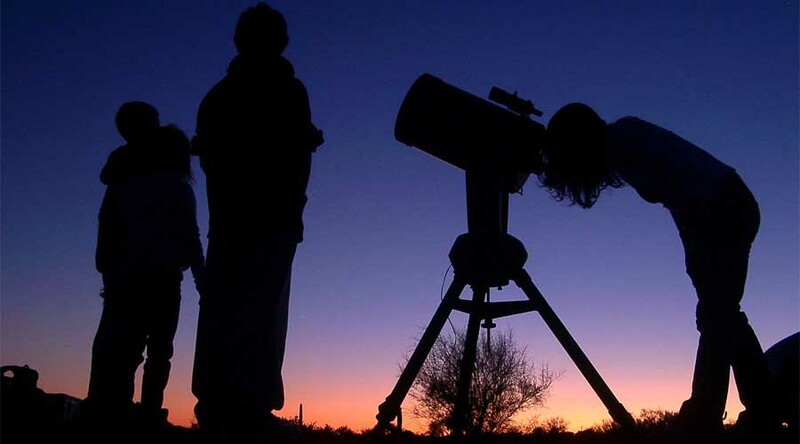 Book before the 28 February 2019, for travel in May, June, July and August and qualify for the Early Bird Special. Transfers, beverages and gate entry fees which are currently R 121.00 per person per night and R 71.00 per child (4-11 years) per night. Subject to increase in 2018/2019 without prior notification. Driver / Guide Rate: Applicable for group reservations and limited to one room only. R 1'400.00 single per night accommodation and meals. 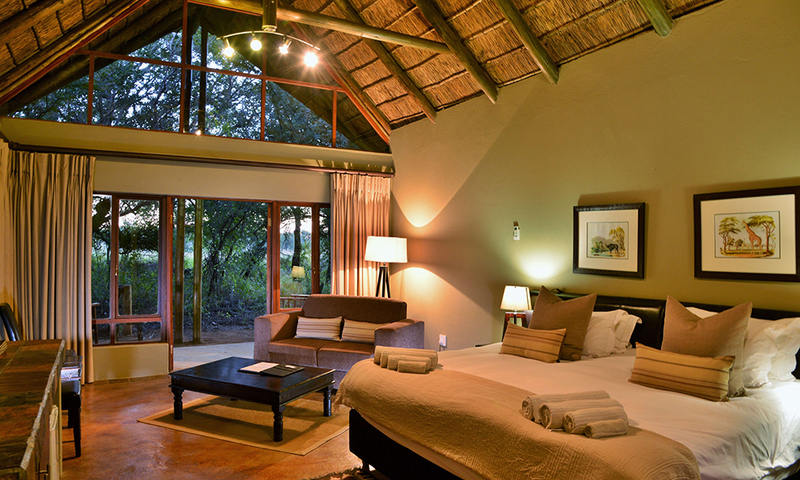 The main lodge boasts 18 very spacious and luxuriously appointed bedroom suites. 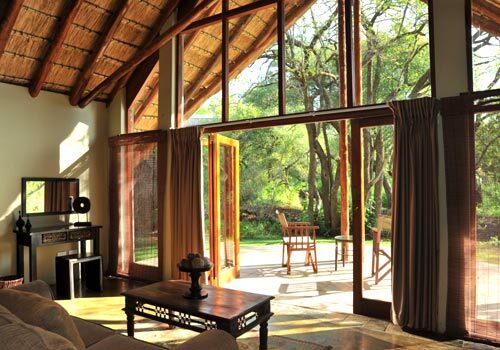 Each comfortable air-conditioned suite offers a television, tea/coffee making facilities, mini bar and private patio that opens out into the bush. Each suite has an open plan bathroom with a closed toilet. There is a separate bath and shower as well as an outdoor shower, with the exception of room 10. 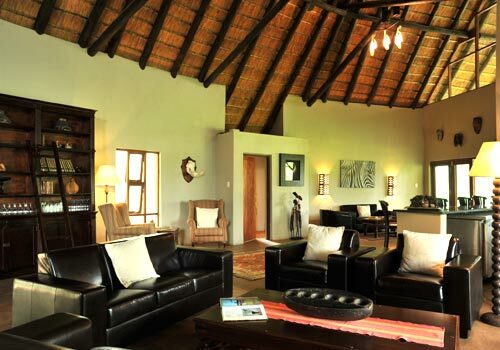 The 4 Family Suites are situated at the Satelite Camp approximately 700 metres from the Main Lodge. The Camp has its own pool and although there are no TV’s in the rooms there is a central lounge with TV. Children of all ages are welcome at the lodge. 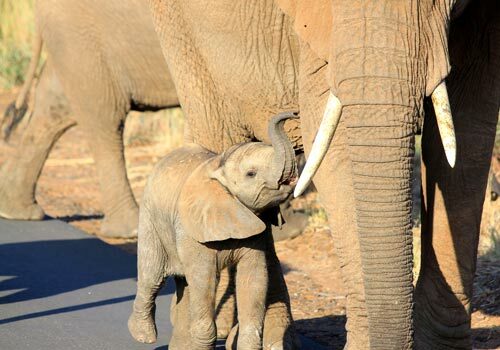 Children 0 – 5 years stay complimentary when sharing with parents, not permitted on game drives. 6 – 11 years enjoy a 50% discount on the adult sharing rate and are permitted on game drives at management discretion. Children 12 years and older pay the full adult rate and are permitted on game drives. Baby sitting is available at the lodge. From Pretoria, Take the N1 north, exit onto the N4 direction Rustenburg. Travel along the N4 and take the R556 off ramp (Sun City/ Pilanesberg National Park), turn right at the stop, over the highway and head straight to Sun City. Continue straight pass the Sun City Gate (right hand side) for approximately 5 km on the R556, passing the Sun Village Shopping Centre (right hand side). At the 4-way stop, turn right and travel approximately 30kms on the R565 Derdepoort road where you will find the entrance of Black Rhino Game Reserve on your right hand side. It is a tar road all the way to the entrance of the reserve. From Johannesburg & Sandton, take the R512 past Hartebeestpoortdam till it connects to the N4, and use the directions from the N4 as mentioned above. There are two, weekly scheduled flights with SA Express from Johannesburg to Sun City on a Monday and a Friday, as well as from Cape Town to Sun City. 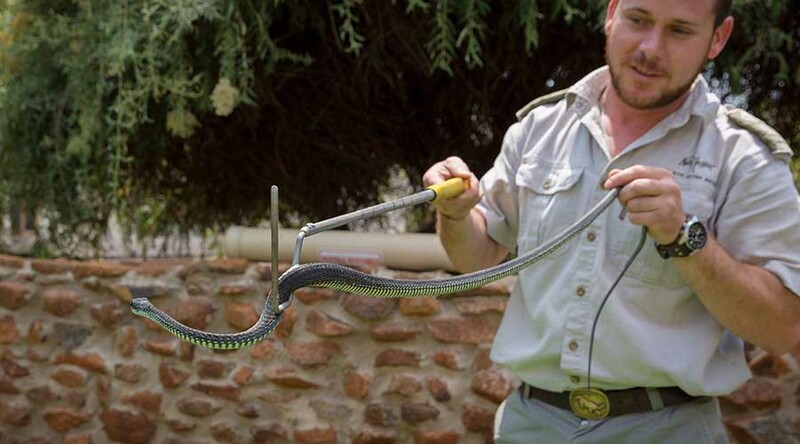 A transfer can be arranged from Sun City to Black Rhino Game lodge. 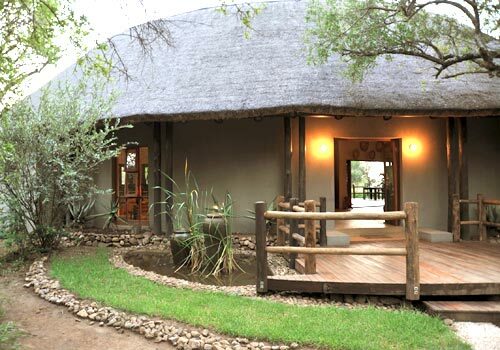 Located in the west side of the ‘Malaria Free’ Pilanesberg National Park, and only 33 km from Sun City, The Black Rhino Game Lodge is built between a Tamboti forest, overlooking a busy waterhole, which is a hive of bird and animal activity, and a playground for the elephants. On many occasions, the roaring of lions breaks the stillness of the night, and the franklins singing the morning wake up call. 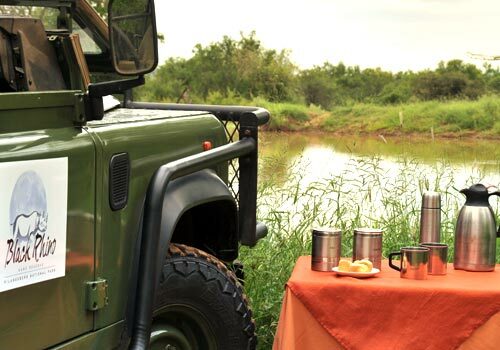 Early in the morning, guests may enjoy a cup of coffee followed by an adventurous game drive with professional guides. Check out time 10h00 hrs/ Check in time 14h00 hrs. 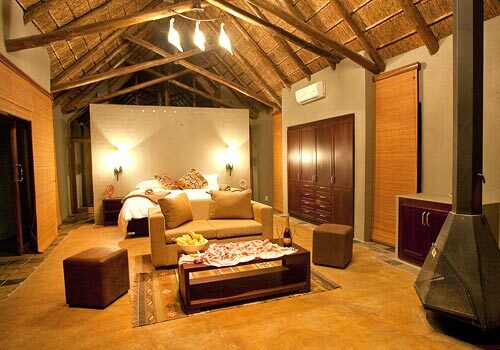 Black Rhino Game Lodge is in a Malaria free area. BY ROAD From Pretoria, Take the N1 north, exit onto the N4 direction Rustenburg. Travel along the N4 and take the R556 off ramp (Sun City/ Pilanesberg National Park), turn right at the stop, over the highway and head straight to Sun City. Continue straight pass the Sun City Gate (right hand side) for approximately 5 km on the R556, passing the Sun Village Shopping Centre (right hand side). At the 4-way stop, turn right and travel approximately 30kms on the R565 Derdepoort road where you will find the entrance of Black Rhino Game Reserve on your right hand side. It is a tar road all the way to the entrance of the reserve. From Johannesburg & Sandton, take the R512 past Hartebeestpoortdam till it connects to the N4, and use the directions from the N4 as mentioned above. When you reach Sun City – Please give us a call on 083 297 5020 GPS Co-ordinates for Main Gate: S25° 10’ 54” E26° 57’ 21” BY AIR There are two, weekly scheduled flights with SA Express from Johannesburg to Sun City on a Monday and a Friday, as well as from Cape Town to Sun City. 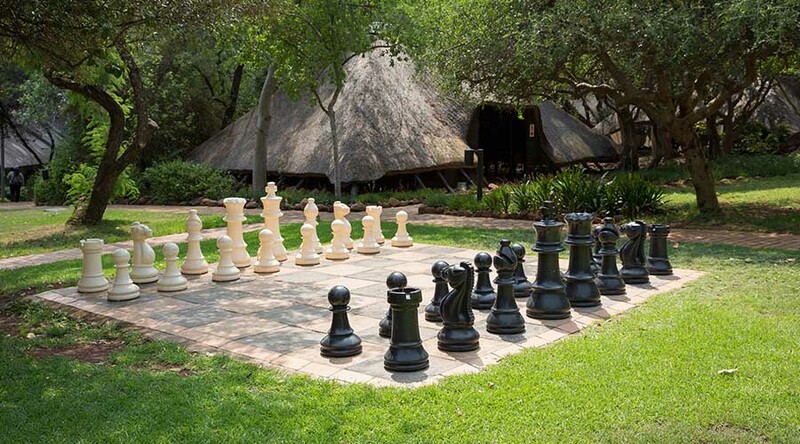 A transfer can be arranged from Sun City to Black Rhino Game lodge. 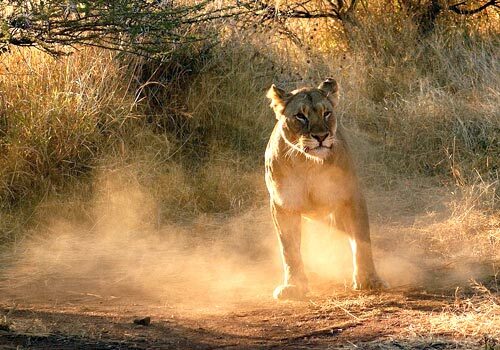 Unlike any other national game park, the Pilanesberg hosts a combination of animal, bird, insect, reptilian and vegetation species, such as the Brown Hyena, Springbok, Red Eyed Bulbul and Camel Thorn tree. These species are normally found in dry areas, co-habitat with Impala, Black Eyed Bulbul and the Cape Chestnut trees are normally found in wetter areas. The Pilanesberg National Park is a perfect combination of the Kalahari and the wetter Lowveld. A major advantage of the Pilanesberg is that it is ‘Malaria Free’, which is not the case with other game parks further north. 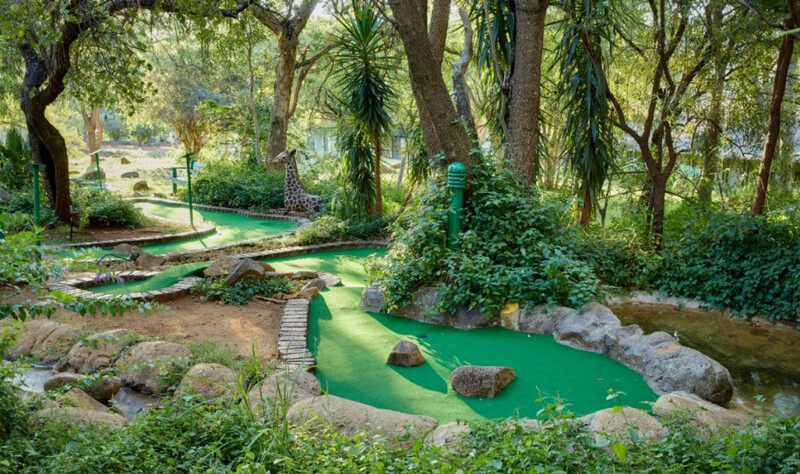 Sun City, best known for hosting the Million Dollar Golf Challenge and other spectacular events, lies on the border of the Pilanesberg, and is only a 33km drive from Black Rhino Game Reserve. 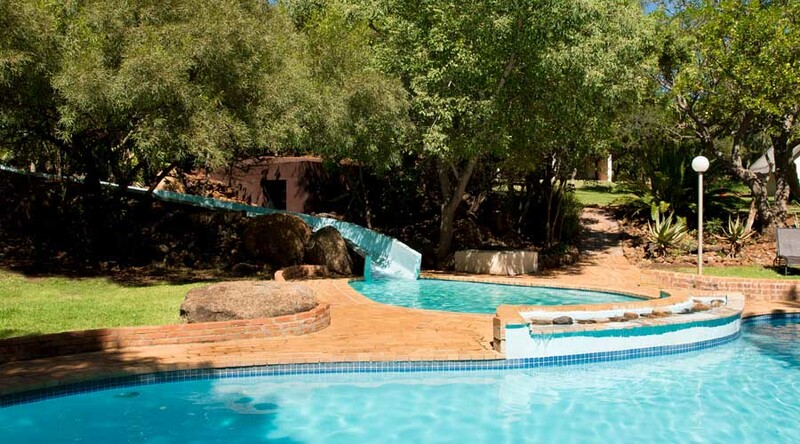 Approximately 150 km from Johannesburg | Approximately 30 km from Sun City. 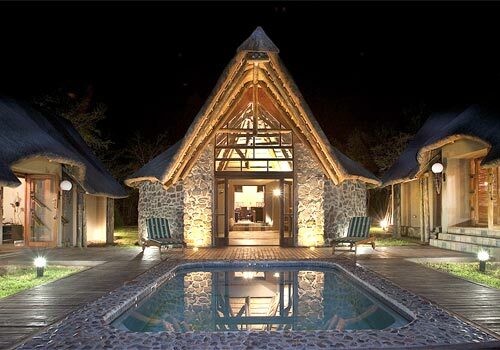 Black Rhino Game Lodge is located on the private 2 000 ha. 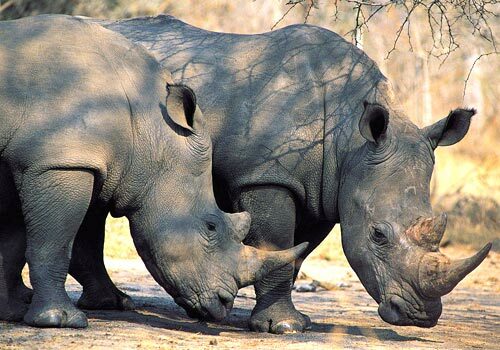 Black Rhino Game Reserve which forms parts of the 58 000 ha Pilanesberg National Park. It is a Big 5 reserve and in a malaria free area. 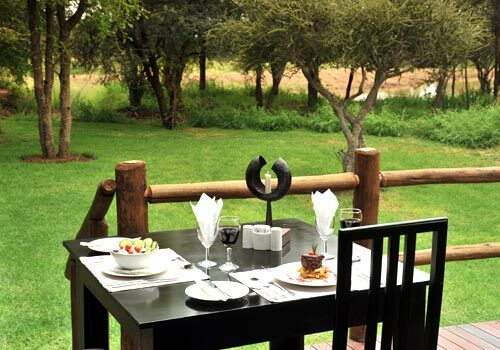 • Black Rhino Game Lodge has got traversing rights into the Pilanesberg National Park. Derdepoort road. There is no public access between the national park and the reserve. The road is tarred till by the main entrance gate and in good state of repair. A good quality gravel road leads from the gate to the lodge, located about 3 km inside the reserve and accessible with a sedan. All guests entering in to the reserve have to sign an indemnity at the gate. This is standard procedure. The speed limit in the reserve is only 30 km/h (18 mi/h) and is strictly enforce for their own safety. Guest cannot stop and exit their vehicles in the reserve. No self-drive game drives are allowed on the Black Rhino Game Reserve. Should guests wish to do a self-drive of the Pilanesberg National Park, they have to exit the reserve and enter at one of the national parks gates (fees are applicable at the gate). Bakubung gate is the closest. 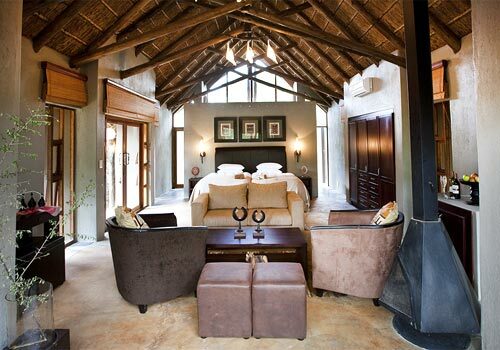 No day visitors are allowed on the Black Rhino Game Reserve, it is for exclusive use of overnight guests. 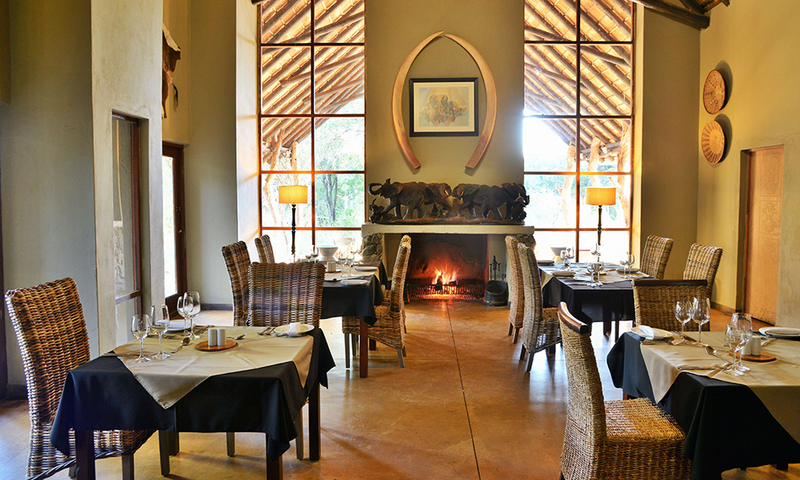 The package on offer is board and lodge, including 3 meals and 2 game drives. Excluded are the conservation levies and all beverages, including sundowners on the game drive. Included are coffee and tea from the coffee station in the restaurant and bottled water in the rooms. 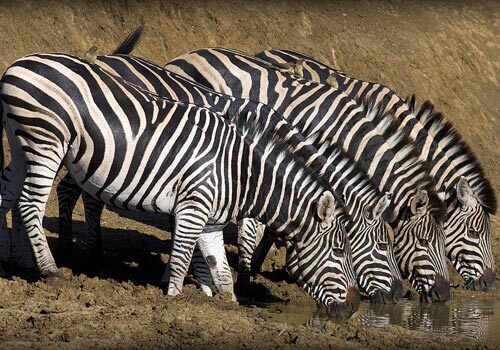 Water during meals or game drive is considered a beverage, thus it will be charged. Check in into the rooms is from 14:00, Check out is strictly at 11:00 to allow time for preparing the rooms for new arrivals at 14:00. All rooms have a no smoking policy. The lodge is not star rated. The entire lodge is fenced in with an electric fence and it is safe to walk outside. Guests are not permitted to leave the entry gate at the lodge on foot. Safety plans are in place for emergencies. TV’s with satellite package – package is commercial and limited channels are available. Tea & coffee making facilities including a kettle and mini fridge. o Full bathroom with bath and shower. Lounge area in the room. There is no room number 13. Double or twin options in certain rooms. Extra beds for children under 12, up to two (2) per room. Limited number available. o The pathways to the rooms are not lit, but a flashlight is provided with every key. • The main centre houses the kitchen, restaurant, bar and lounge areas. Dinning is outdoors on the deck, but it is weather dependant. The indoor restaurant area has got a fire place. The main centre faces a waterhole. 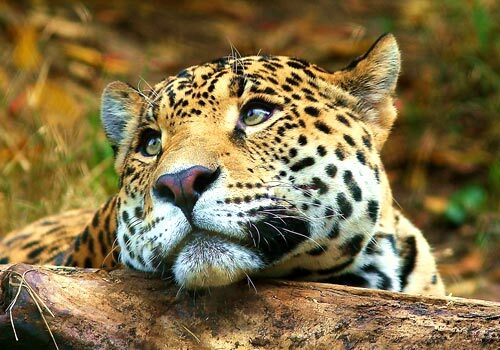 Animals are sighted from time to time. Wi-Fi is free of charge and only available in the main centre. Meals are either a la carte or buffet, depending on occupancy. Please enquire! Breakfast consist of a continental and a hot breakfast from the kitchen. Lunch is a light lunch. Before afternoon game drive, high tea is served. No charge applicable. Dinner is more formal with more variety. 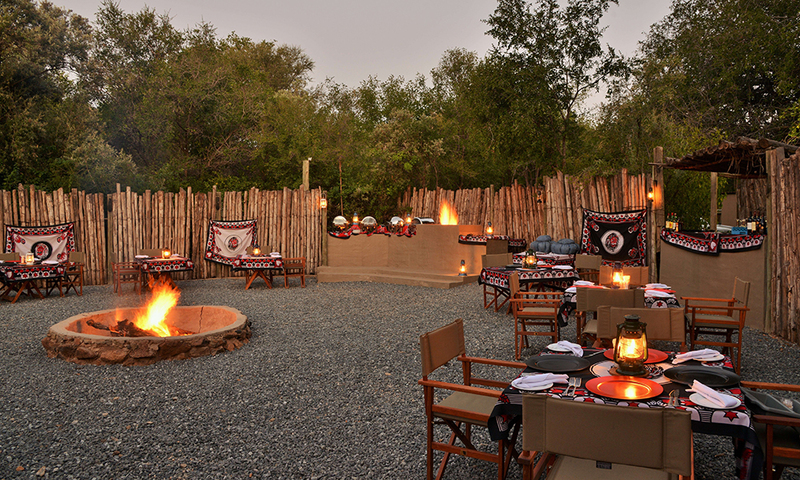 On Wednesday & Saturdays, a traditional South African dinner braai menu is served, in the Boma around a big fire. This is weather dependant. A kiddies menu is available. Guest should allow at least 30 min preparation time. Morning game drives are into the Pilanesberg National Park. Afternoon game drives are on the Black Rhino Game Reserve. Seasonal times are in place for game drives departures. Please enquire! 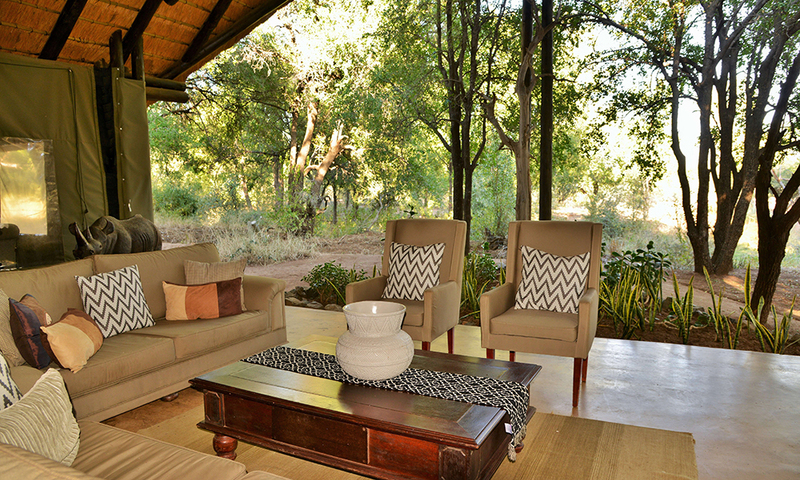 Guest should arrive at least half an hour before the afternoon game drive. Vehicles cannot be held back after the allotted departure time. The morning drive includes a coffee stop. Coffee is taken along by the ranger. Afternoon drives include a sundowner stop. Drinks orders are taken during high tea by the rangers. This drink is optional and not included and payable. Ponchos are available on drives and blankets are provided during winter and other cold times. Game drives are totally weather dependant and cannot be refunded. Children under the age of six (6) are not permitted on a game drive, children between six (6) and twelve (12) are at the rangers discretion. Should a child be noisy or disturbing other guests, the ranger has got the right to reprimand the child/parent. 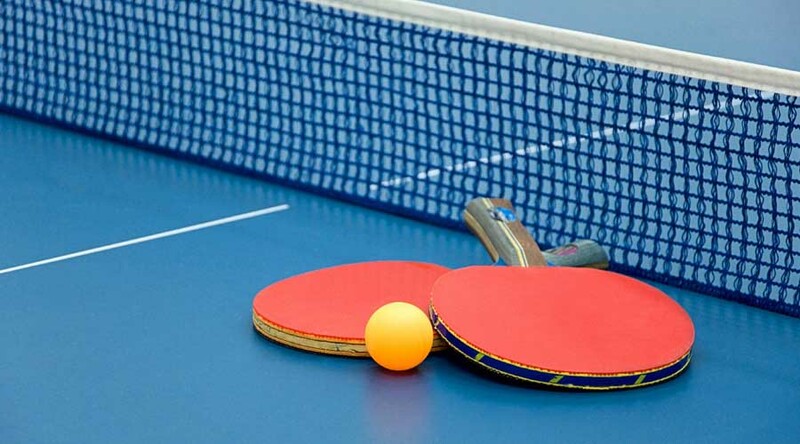 If the situation continues, the game drive can be cut short. The child will also not be allowed on the next drive. Baby-sitting services is available at an extra charge and must be pre-arranged for meals and game drives. Please enquire. Bush bumbles are offered for the children who cannot join on a game drive. 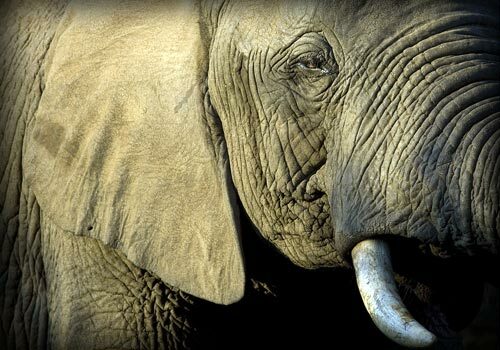 Although the reserve and the national park boost the Big 5, sightings cannot be guaranteed due to the animals roaming free and the size of the reserve and the national park. 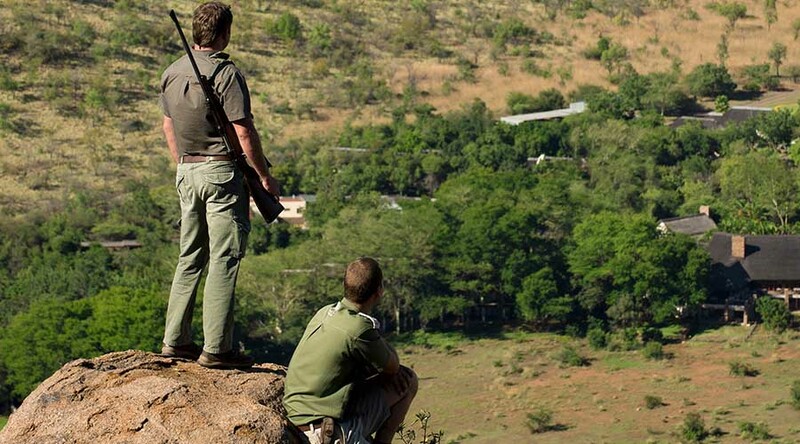 The rangers take great care to look for them and offer all guests an enjoyable and informative game drive. 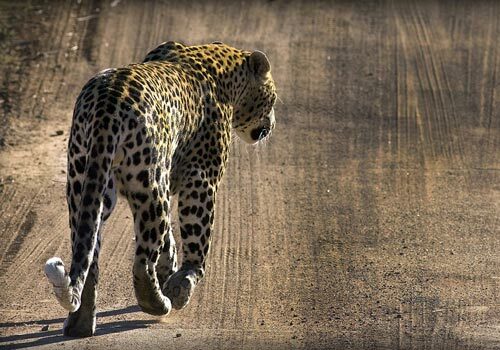 No off-road driving is allowed to get close ups of animals, all vehicles must stay on the demarcated roads. 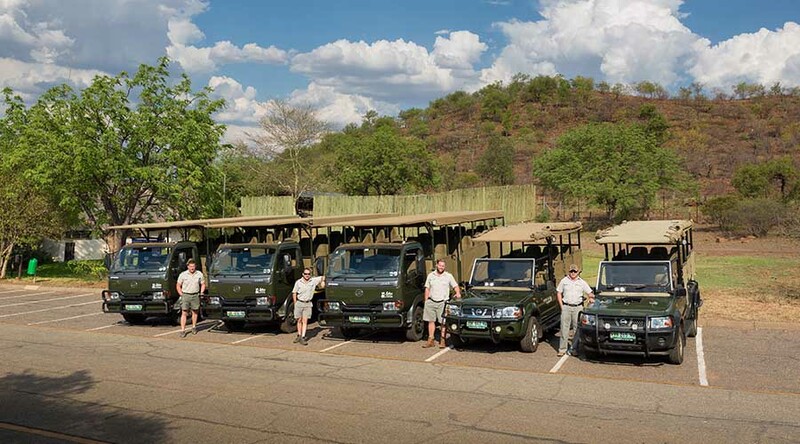 The open safari vehicles can accommodate 10 pax plus the driver. Every occupant must occupy a seat. No lap sitting is allowed. The lodge has got 3 splash pools. Pool towels are provided. The lodge has got a generator if there is a power failure, due to regulations; it can only run till 22:00 pm. Travel along the N4 and take the R556 off ramp (Sun City / Pilanesberg National Park), turn right at the stop, over the highway and head straight to Sun City. Continue straight pass the Sun City Gate (right hand side) for approximately 5 km on the R566, passing the Sun Village Shopping Centre (right hand side). At the 4-way stop, turn right and travel approximately 30 kms on the R565 Derdepoort road where you will find the entrance of Black Rhino Game Reserve on your right hand side. It is a tar road all the way to the entrance of the reserve. From Johannesburg and Sandton, take the R512 past Hartebeestpoortdam till it connects to the N4, and use the directions from the N4 as mentioned above. 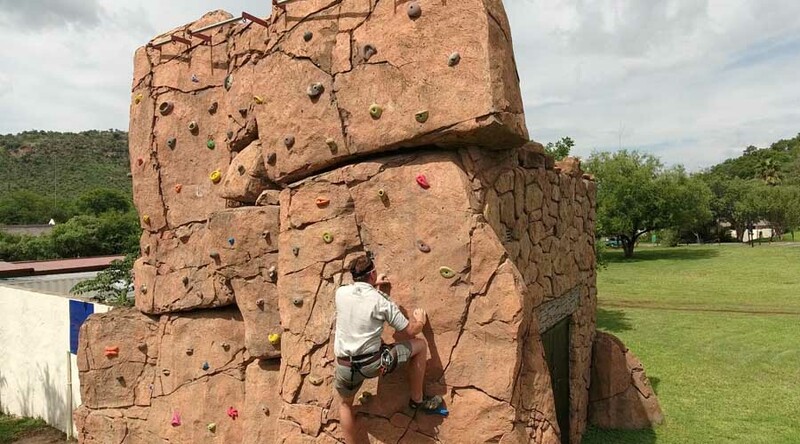 When you reach Sun City - Please give us a call on 083 297 5020 GPS co-ordinates for Main Gate: S25 10'54" E26 57'21"
Check-in: 14h00 Check-out: 10:00 Baby-sitting services are available at R50.00 per hour and must be booked in advance. Gate entry fees for Black Rhino will be R120 per person per night and R70 per child (4 - 11 years) per night. Children of all ages are welcome at the lodge. Children under 12 years of age can be accommodated with parents in the same room. The lodge has a limited number of extra beds so it is subject to availability. All cancellations to be sent in writing to the Reservations Office. Penalties are calculated on the total cost of stay. All no shows will be charged at 100% of the total value of the booking.